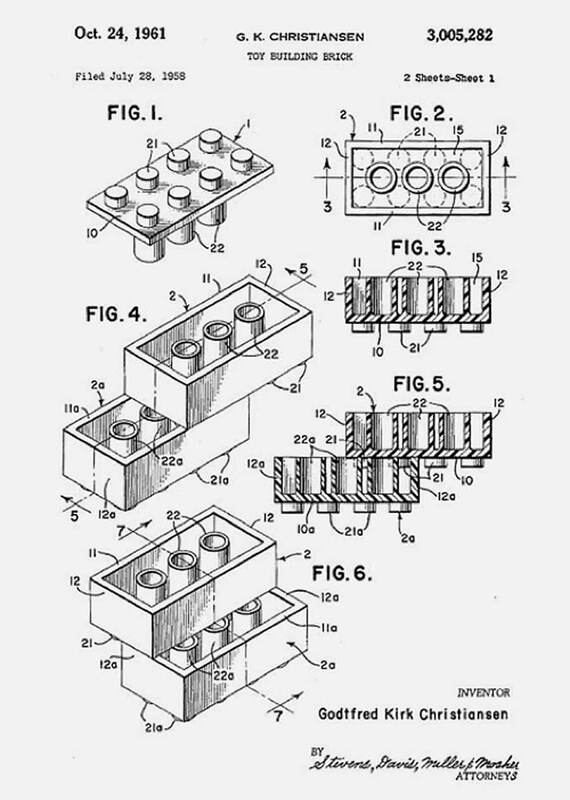 Came across this: The Original Lego Brick Patent (Filed 1958), by Godfred Kirk Christiansen, earlier this morning over on Khooll.com, and it was certainly an intriguing find to start off this Monday morning. So a little history: You’ll notice on the top of the patent, that the name is stated as G. K . Christiansen, yet the company was initially started by a certain Ole Kirk Christian. He was a Danish carpenter, who during an economic depression, and almost going bankrupt, started making these wonderful wooden toys. Ole started selling them from his workshop, and these wooden toys, more specifically his company, eventually received a name: LEGO, and become the LEGO Group. The reason why the Patent is in Ole’s third son’s name, Godfred Kirk Christiansen, is that Ole passed away at the age of 66, and Godtfred took over the business, and subsequently filed for the LEGO patent in 1958. What I didn’t know was that LEGO is formed from Danish words: :“leg godt” meaning “play well”. Lego also translates into Latin as “I put together”. Now, if only other companies would put as much thought into their brand names as Ole Kirk Christian had done. » Next Post: Shocker! A Logo Designer Who Didn’t Do Art School, College or University!